For other uses, see Epiphanes (disambiguation). Antiochus IV Epiphanes (/ænˈtaɪ.əkəs ɛˈpɪfəniːz, ˌæntiˈɒkəs/; Ancient Greek: Ἀντίοχος ὁ Ἐπιφανής, Antíochos ho Epiphanḗs, "God Manifest"; c. 215 BC – November/December 164 BC) was a Hellenistic Greek king of the Seleucid Empire from 175 BC until his death in 164 BC. He was a son of King Antiochus III the Great. His original name was Mithradates (alternative form Mithridates); he assumed the name Antiochus after he ascended the throne. Notable events during the reign of Antiochus IV include his near-conquest of Egypt, his persecution of the Jews of Judea and Samaria, and the rebellion of the Jewish Maccabees. 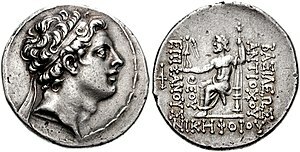 Antiochus was the first Seleucid king to use divine epithets on coins, perhaps inspired by the Bactrian Hellenistic kings who had earlier done so, or else building on the ruler cult that his father Antiochus the Great had codified within the Seleucid Empire. These epithets included Θεὸς Ἐπιφανής "manifest god", and, after his defeat of Egypt, Νικηφόρος "bringer of victory". However, Antiochus also tried to interact with common people by appearing in the public bath houses and applying for municipal offices, and his often eccentric behavior and capricious actions led some of his contemporaries to call him Epimanes ("The Mad One"), a word play on his title Epiphanes. Antiochus was a member of the Greek-speaking Seleucid dynasty and was the son and potential successor of Antiochus III the Great, and as such he became a political hostage of the Roman Republic following the Treaty of Apamea in 188 BC. His older brother Seleucus IV Philopator followed his father onto the throne in 187 BC, and Antiochus was exchanged for his nephew Demetrius I Soter, the son and heir of Seleucus. Seleucus was assassinated by the usurper Heliodorus in 175 BC, but Antiochus in turn ousted him. Seleucus' legitimate heir Demetrius I Soter was still a hostage in Rome, so Antiochus seized the throne for himself with the help of King Eumenes II of Pergamon, proclaiming himself co-regent with another son of Seleucus, an infant named Antiochus (whom he then murdered a few years later). The guardians of King Ptolemy VI Philometor demanded the return of Coele-Syria in 170 BC, but Antiochus launched a preemptive strike against Egypt, conquering all but Alexandria and capturing King Ptolemy. To avoid alarming Rome, Antiochus allowed Ptolemy VI to continue ruling as a puppet king. Upon Antiochus' withdrawal, the city of Alexandria chose a new king, one of Ptolemy's brothers, also named Ptolemy (VIII Euergetes). The Ptolemy brothers agreed to rule Egypt jointly instead of fighting a civil war. In 168 BC, Antiochus led a second attack on Egypt and also sent a fleet to capture Cyprus. Before he reached Alexandria, his path was blocked by a single elderly Roman ambassador named Gaius Popillius Laenas who delivered a message from the Roman Senate directing Antiochus to withdraw his armies from Egypt and Cyprus or consider himself in a state of war with the Roman Republic. Antiochus said he would discuss it with his council, whereupon the Roman envoy drew a line in the sand around Antiochus and said: "Before you leave this circle, give me a reply that I can take back to the Roman Senate." This implied Rome would declare war if the King stepped out of the circle without committing to leave Egypt immediately. Weighing his options, Antiochus decided to withdraw. Only then did Popillius agree to shake hands with him. Bust of Antiochus IV at the Altes Museum in Berlin. According to the authors of the Books of the Maccabees, while Antiochus was busy in Egypt, a rumor spread that he had been killed. In Judea, the deposed High Priest Jason gathered a force of 1000 soldiers and made a surprise attack on the city of Jerusalem. Menelaus, the High Priest appointed by Antiochus, was forced to flee Jerusalem during a riot. King Antiochus returned from Egypt in 168 BC, enraged by his defeat; he attacked Jerusalem and restored Menelaus, then executed many Jews. When these happenings were reported to the king, he thought that Judea was in revolt. Raging like a wild animal, he set out from Egypt and took Jerusalem by storm. He ordered his soldiers to cut down without mercy those whom they met and to slay those who took refuge in their houses. There was a massacre of young and old, a killing of women and children, a slaughter of virgins and infants. In the space of three days, eighty thousand were lost, forty thousand meeting a violent death, and the same number being sold into slavery. Antiochus decided to side with the Hellenized Jews in order to consolidate his empire and to strengthen his hold over the region. He outlawed Jewish religious rites and traditions kept by observant Jews and ordered the worship of Zeus as the supreme god (2 Maccabees 6:1–12). This was anathema to the Jews and they refused, so Antiochus sent an army to enforce his decree. The city of Jerusalem was destroyed because of the resistance, many were slaughtered, and Antiochus established a military Greek citadel called the Acra. The date of Antiochus's persecution of the Jews in Jerusalem is variously given as 168 or 167 BC. In their commentary on the Book of Daniel, Newsom and Breed argue for 167, although they state that good arguments can be made for either chronology. Mina of Antiochus IV Epiphanes. Modern scholarship on the other hand considers the Maccabean revolt less as an uprising against foreign oppression than as a civil war between the orthodox and reformist parties in the Jewish camp. It seems that the traditionalists, with Hebrew/Aramaic names such as Onias, contested with the Hellenizers, with Greek names such as Jason and Menelaus, over who would be the High Priest of Israel. Other authors have pointed to the possibility of socioeconomic motives, as well as religious ones, as having been primary drivers of the civil war. What began in many respects as a civil war escalated when the Hellenistic kingdom of Coele-Syria sided with Hellenizing Jews in their conflict with the traditionalists. As the conflict escalated, Antiochus took the side of the Hellenizers by prohibiting the religious practices around which the traditionalists had rallied. This could explain why the king banned the traditional religion of a whole people, in a total departure from typical Seleucid practice in other settings. King Mithridates I of Parthia took advantage of Antiochus' western problems and attacked from the east, seizing the city of Herat in 167 BC and disrupting the direct trade route to India, effectively splitting the Greek world in two. Antiochus recognized the potential danger in the east but was unwilling to give up control of Judea. He sent a commander named Lysias to deal with the Maccabees, while the King himself led the main Seleucid army against the Parthians. Antiochus had initial success in his eastern campaign, including the reoccupation of Armenia, but he died suddenly of disease in 164 BC. According to the scroll of Antiochus, when Antiochus heard that his army had been defeated in Judea, he boarded a ship and fled to the coastal cities. Wherever he came the people rebelled and called him "The Fugitive," so he drowned himself in the sea. 5 But the all-seeing Lord, the God of Israel, struck him with an incurable and invisible blow. As soon as he stopped speaking he was seized with a pain in his bowels, for which there was no relief, and with sharp internal tortures— 6 and that very justly, for he had tortured the bowels of others with many and strange inflictions. 7 Yet he did not in any way stop his insolence, but was even more filled with arrogance, breathing fire in his rage against the Jews, and giving orders to drive even faster. And so it came about that he fell out of his chariot as it was rushing along, and the fall was so hard as to torture every limb of his body. 8 Thus he who only a little while before had thought in his superhuman arrogance that he could command the waves of the sea, and had imagined that he could weigh the high mountains in a balance, was brought down to earth and carried in a litter, making the power of God manifest to all. Antiochus IV ruled the Jews from 175 to 164 BC. He is remembered as a major villain and persecutor in the Jewish traditions associated with Hanukkah, including the books of Maccabees and the "Scroll of Antiochus". Rabbinical sources refer to him as הרשע harasha ("the wicked"); the Jewish Encyclopedia concluded that "[s]ince Jewish and heathen sources agree in their characterization of him, their portrayal is evidently correct", summarizing this portrayal as one of a cruel and vainglorious ruler who tried to force on all the peoples of his realm a Hellenic culture, "the true essence of which he can scarcely be said to have appreciated". Whether Antiochus's policy was directed at extermination of Judaism as a culture and a religion, though, is debatable on the grounds that his persecution was limited to Judea and Samaria (Jews in the diaspora were exempt), and that Antiochus was hardly an ideologically motivated Hellenizer. Erich S. Gruen suggests that, instead, he was driven more by pragmatics such as the need to gather income from Judea. ^ "Antiochus IV Epiphanes". Livius.org. ^ Coogan, Michael David (2007). The New Oxford Annotated Bible with the Apocryphal/Deuterocanonical Books: New Revised Standard Version. Oxford University Press. p. 1253. ISBN 9780195288803. ... through Persian rule, to the time of Alexander the Great, and finally to the attacks against Judaism and Jerusalem by the Syrian-Greek ruler Antiochus IV Epiphanes in the early second century bce. ^ Jacobson, Diane L. (1991). A Beginner's Guide to the Books of the Bible. Augsburg Books. p. 59. ISBN 9781451406580. Though set in Babylon over a seventy-year period (606-536 b.c.) that includes the exile, Daniel actually dates from around 167— 164 during the Jewish persecution by the Greek king, Antiochus IV Epiphanes (175-163). ^ a b Goodman, Ellen (1995). The Origins of the Western Legal Tradition: From Thales to the Tudors. Federation Press. p. 69. ISBN 9781862871816. Under the leadership of Antiochus IV (a Seleucid Greek) a Greek-style polis was established in Jerusalem. ^ Samuels, Ruth (1967). Pathways through Jewish history. Ktav Pub. House. p. 98. OCLC 899113. Antiochus IV spared no pains to defend his empire against the growing power of Rome. Proud of his Greek ancestry and determined to unite all the peoples of the ancient world under his rule, he had sought to force his subjects to follow the Greek way of life to the exclusion of all others. ^ Polybius 29.27.4, Livy 45.12.4ff. ^ a b Gruen, Erich S. (1993). "Hellenism and Persecution: Antiochus IV and the Jews". In Green, Peter (ed.). Hellenistic History and Culture. University of California Press. pp. 250–252. ^ Telushkin, Joseph (1991). Jewish Literacy: The Most Important Things to Know about the Jewish Religion, Its People, and Its History. W. Morrow. p. 114. ISBN 0-688-08506-7. ^ Johnston, Sarah Iles (2004). Religions of the Ancient World: A Guide. Harvard University Press. p. 186. ISBN 0-674-01517-7. ^ Greenberg, Irving (1993). The Jewish Way: Living the Holidays. Simon & Schuster. p. 29. ISBN 0-671-87303-2. ^ Schultz, Joseph P. (1981). Judaism and the Gentile Faiths: Comparative Studies in Religion. Fairleigh Dickinson Univ Press. p. 155. ISBN 0-8386-1707-7. ^ Gundry, Robert H. (2003). A Survey of the New Testament. Zondervan. p. 9. ISBN 0-310-23825-0. ^ Freedman, David Noel; Allen C. Myers; Astrid B. Beck (2000). Eerdmans Dictionary of the Bible. Wm. B. Eerdmans Publishing. p. 837. ISBN 0-8028-2400-5. ^ Wood, Leon James (1986). A Survey of Israel's History. Zondervan. p. 357. ISBN 0-310-34770-X. ^ Tchrikover, Victor. Hellenistic Civilization and the Jews. ^ "Antiochus IV., Epiphanes". Jewish Encyclopedia. Volume I: Aach–Apocalyptic literature. Funk and Wagnalls. 1925. pp. 634–635. Wikimedia Commons has media related to Antiochus IV.